Today majority of the manufacturers choose CNC machining for manufacturing parts, items in large quantities. CNC machines are used to accomplish the process of CNC machining. The CNC machine makes use of computer numerical control in place of mills, grinders, lathes and routers which are the requirement of conventional machining. Bu this computer numerical control is totally different from PCs when it comes to software they use for controlling the machine. This software is programmed using G-code and it is customized for every machine. G-code is a different CNC machine language which offers precise controlling of features like feed rate, coordination, speed as well as location. These are the features which are required by CNC machines. So, in case of CNC machines, a computerized machine is driven by specialized software. The software is designed with G-code which completely customized. The software which is infused with G-code sits on the computerized machine which just looks like a sophisticated desktop. There will be a programmer who sits at the computer console for commanding the machine and this work is equivalent to works of several operators who sit and control lathes, routers, grinders, shapers, and mills. So, it is possible to achieve holds and reaches very effectively which is difficult to expect from combination of human operators and conventional machining. Since there will be high demand for items in large quantities, majority of the manufacturers, choose CNC machining in these days. Since CNC machines are capable of automating the job, even when there is several cuts, it is time saving and cost effective in many cases. Both conventional and CNC machining aim to come up with same thing and they use same thing that is raw chunk but there are many differences between these two. In case of CNC machining they make use of 2D or 3D model which are produced using CAD or computer aided design. They produce the model for final part. This is the prototype which will be used as the input for the software. 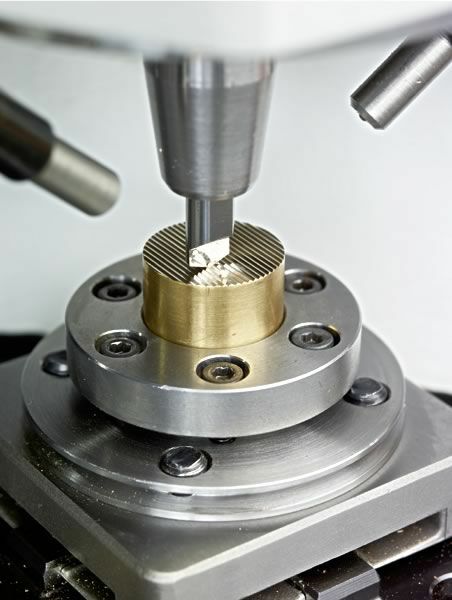 The software is operated through a computer and helps in commanding the machining tools for producing the actual component. Since CNC machining is based on autonomous machining capacity and it uses digital template, it provides high level of precision. There is very less chance for human errors when CNC machining is used. The precision or accuracy achieved is 1/1000th. CNC machines can perform around the clock on daily basis. They can work even on weekends and on holidays as well. When they need repair or maintenance that is only time they stop. Once the specification is decided and design parameters are entered, CNC machine starts its consistent performance. So, it will offer execution of products even in huge quantities without any delay. They are always scalable and offer flexible scalability. In case of CNC machines, replication of outputs is very easy. With the same design software production can be extended to the required scale. This is not the case with conventional machining. Replication is not easy in case of conventional machining. Advanced software can perform any kind of jobs in case of CNC machining which is not easy for even most gifted engineers. CNC machines are capable to offer components of any texture, shape, and size. For execution of tasks in case of CNC machining there is fewer requirements of labor or personnel. Single skilled worker can handle many autonomous CNC machines. But in case of manual or conventional machines, there must be one operator to handle every machine and for a group of operators there should be one supervisor. The output produced using CNC machines can be matched exactly. But this is not possible with conventional machining. Even the most gifted worker here cannot produce outputs which are exactly same. So, in case of CNC machines the products match perfectly with their prototypes.